She received a careful and pious training, was a good Latin scholar, and well read in divinity and other branches of learning. Her hymns show her to have been of a deeply pious nature, and of intense love to Jesus. They were composed rather for her own edification than for use in public worship. Ten of them were included in the Budolstadt Gesang-Buch, 1682. They, were collected, to the number of 206, and edited by her cousin Emilie (probably assisted by A. Fritsch) as Die Stimme der Freundin, das ist: Geistliche Lieder welche, aus brünstiger und biss ans Ende beharrter Jesus Liebe verfertiget und gebraucht, &c. Rudolstadt, 1687. This was reprinted, with an introduction by W. Thilo, at Stuttgart, 1856. Jesus, Jesus, Jesus only. In full, by A. Crull, as No. 282 in the Ohio Lutheran Hymnal, 1880. Other translations are :—(1) "Jesus, Jesus, nought but Jesus, Shall my wish and," in the Supplement to German Psal., ed. 1765, p. 11. (2) "Jesus, 'tis my aim divine," by Miss Dunn, 1857, p. 107. (3) “ 'Tis Jesus that's my sole desire," by Dr. G. Walker, 1860, p. 92. (4) "Jesus, Jesus, naught but Jesus, Can my," by R. Massie, in the British Herald, July, 1865, p. 103, and in Reid's Praise Book, 1872, No. 393. (5) "Jesus, Jesus, nought but Jesus, Shall my wish be," in Cantica Sanctorum, 1880, No. 97.
ii. Jesu Blut komm über mich. [Holy Communion.] A Passiontide Hymn on the Blood of Jesus. 1687, p. 45, No. 14, in 8 st. In the Blätter für Hymnologie, 1886, p. 180, it is cited as in the 2nd ed., 1679, of A. Fritsch's Himmels-Lust (1st ed., 1670, does not contain it); and as there marked "S. J. G. Z. S. V. H.," the initials of the elder sister, Sophie Juliane. Translated as:-—"Jesus' Blood come over me," as No. 448, in pt. i. of the Moravian Hymn Book, 1754.
iii. Sorge, Vater! sorge du. [Morning.] 1687, No. 168, in 7 st., entitled "On Resignation to the Care of God," and founded on 1 Peter v. 7. Previously in the Rudolstadt Gesang-Buch,1682, p. 692. 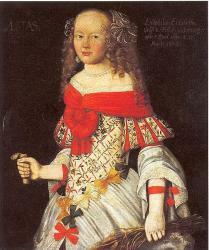 Ludmilla Elisabeth of Schwarzburg-Rudolstadt (also Ludomilla or Ludämilie; 7 April 1640 – 12 March 1672 in Rudolstadt) was a German noblewoman and a hymn poet. She was a Countess of Schwarzburg-Rudolstadt by birth.